Guild's laudable organ and orchestra series has proved to be immensely popular and now wonder, for the wonderful variety of music provided is surely second to none on all counts. 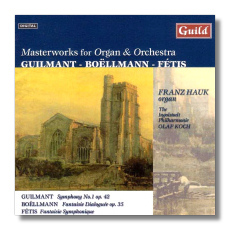 Guilmant's marvellous 'Allegro' and 'Marche Fantasie' that also includes the luxury scoring of harps are trenchantly interpreted by the indomitable Franz Hauk and the erstwhile Ingolstdat Philhramonic. Both virtually explode in the monumental Boëllmann Fantasie Dialogue that begins peacefully but then develops into a magisterial piece full of unique pomp and pageantry. Guilmant's meditative 'Meditation sur le Stabat Mater' is also a refreshing alternative to the occasional sheer power of the other works. Fétis' 'Fantasie Symphonique' is another barnstorming piece full of magnificence and majesty especially towards its end. The three-movement Symphony #1 by Guilmant is another supreme exercise in virtuosity which is quite superbly handled by Hauk and Koch. Guild's notes provide new and interesting information on the works involved and the whole project is indeed dazzlingly recommendable on all counts.